A white model has revealed on live television she now identifies as ‘a black woman’ after spending £50,000 on surgery. 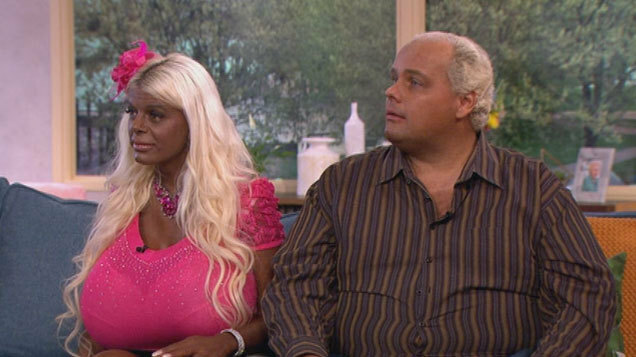 Former air hostess Martina Big, who claims she is 28-years-old, is used to extreme makeovers with size 32S breasts but this change is her most controversial. In an interview on The Maury Show, Martina told host Maury Povich ‘I am black, that is my race’. Martina transformed her body using chemical injections and her own powerful sunbed which gave her the ‘crispy brown’ skin she desired. From as early as she can remember, Martina never felt comfortable in her own skin and dreamt of changing her image. I always wanted to look like a Barbie. I looked at Pamela Anderson and wanted to look like her. In January this year Martina had three injections to change her skin colour further. I am the proud owner of black skin. If they start fading, I won’t feel less black. I will ask them for more. It is better to be black. The feeling inside is just happier. Naturally the audience were shocked as Martina revealed all but she insisted she never meant to insult anybody. I have to learn a lot. I feel a lot of this stuff. At the beginning I only wanted to appear more tanned but when I got the injections, as I looked in the mirror I noticed changes like my hair was growing curly. I don’t want to attack them. I know some feel attacked but it is not my intention. It is not for media attention either. I feel it myself. I do it for myself. Her husband Michael also joined her on the show and spoke about how he was also using tanning injections and would describe himself as ‘medium’. Only Michael knows what this means. Her transformation has been criticised by the Race Equality Foundation who say she has a ‘limited understanding’ of the challenges that ethnic minority groups face. Despite causing outrage, Martina seems certain she won’t stop.